DraftKings is already one of the Biggest Daily Fantasy Sports sites out there giving away Millions of dollars each week for other major sports. When they announced that they were getting into eSports and beginning with League of Legends…it was a game changer for the eSports industry! Looking to start playing eSports and need a little incentive to get going? Use our Draftkings link and you will get a free $3 ticket which can be used to enter a League of Legends fantasy contest after you make your first deposit. Being new to eSports, DraftKings has started out with just League of Legends (LoL) but as the popularity grows, look for more games to be added in the future like Counterstrike or DOTA2. For this review, we will mainly focus on their League of Legends fantasy contests. You don’t have to have a big bankroll to play fantasy eSports at DK, you can play plenty of free contests – some are just for fun, some can win you a “Step Ticket” to use into another contest. If you’ve good, you could potentially win cash without putting in any money. If you want to jump right into real money contests entry fees range from $0.25 – $100. Visit Draftkings Now. Remember you can get a free contest ticket which can be used in any LOL contest or sport you wish after making your first deposit. 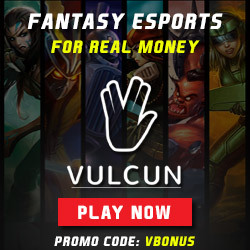 DraftKings lobby is different from other sites like Vulcun or AlphaDraft because they offer other fantasy sports such as football, baseball, basketball etc. If you are only going to play eSports at DraftKings, use the eSports button at the top menu to simply narrow the Lobby down to only eSports games. From there you can filter contests down to types of contests, entry fee, guaranteed, head to head, satellite etc. You can see how many entries are already in a contest to see which ones will fill, and which might be headed for an overlay. Featured contests are highlighted making them easy to identify and head to head games show game opponents who have created contests and are waiting for a challenger. If you have a bunch of friends into eSports, you can create a private league or contest and play against each other for free, or each of them can put in an entry fee and you can all play against each other for real cash. Again, if we had to find a negative for this Draftkings Review it’s that gamers only interested in playing eSports will be coming to a site that promotes almost a dozen other sites instead of just games like League of Legends so the filter feature at the top is your friend. On the other hand, if you are just a fantasy sports fanatic, there are tons of other sports to try at DK which include lesser offered sports like Fantasy UFC/MMA, Fantasy NASCAR, Fantasy Soccer and the surprising popular Fantasy Golf. Once again as of right now there is only League of Legends at Draftkings so the rules and scoring will focus mainly on that game. When DK adds additional Esports games we will update the list. A Roster consists of 8 spots with a max of 4 players from any one League of Legends team in a matchup. Teams do not count towards the 4-player maximum. Also, rosters must span at least 2 different League of Legends (LoL) games. DraftKings’ Draft Screen is more simplistic than some other top fantasy eSports sites – but by no means is it lacking in stats. The left side of the screen shows all the available players at each position. There are tabs to narrow down positions and scroll based on salary cap price. Clicking on a player brings up a player card that has detailed info of their last 10 games and how they scored. Once you choose a player they move to your roster on the right side and you can continue to fill up your lineup. Once a contest has begun, you can watch the games fed through Twitch.tv while simultaneously following how your players are scoring in real time. Having a live feed of all the action adds a fun dynamic to Fantasy Esports and makes it that much more enjoyable. This is a must feature for any daily fantasy Esports site. If you are playing multiple contests, you can go to the “My Contests” tab at the top to get a quick summary of how all your teams are doing. The minimum deposit is $5 and the max is $2000. When you go to withdraw any money, first your original deposit will be credited back to your original deposit method. Any remaining or additional funds will then be withdrawn through the above options. This rule is in place to prevent fraudulent behavior. If you are a resident of one of the prohibited states, it is best to right to your elected officially to put pressure on them to change the laws. Fantasy eSports are legal everywhere else, 5 states don’t know any better right now. We rank DraftKings a 4 out of 5 for fantasy eSports contests. The only thing keeping this DraftKings Review from being a 5 out of 5 is the lack of other fantasy eSports to play such as Call of Duty (CoD), DOTA 2, HearthStone and others. It is more a question of when DraftKings will include them as opposed to when and then our review will likely take that into account and adjust to a 5 out of 5. DraftKings has the backing of Fox Sports who invested $250 Million into them along with many other financial backers. DraftKings is currently one of the best daily fantasy sports sites and will eventually be a leader in fantasy eSports as well, we are certain of that. Draftkings is a leader in the daily fantasy sports industry.